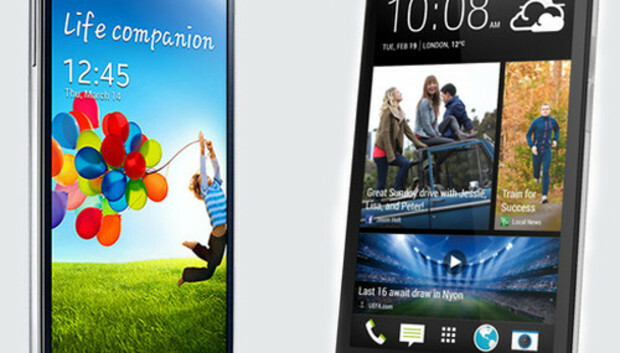 The HTC One and the Samsung Galaxy S4 are two of the hottest smartphones on the market today. But which one is right for you? Different people have different needs and expectations when they purchase a new smartphone. So I've created two lists to help make that crucial decision. The following list spotlights five areas in which the HTC One outperforms the Galaxy S4. For an opposing viewpoint and a look at some ways the Galaxy S4 outperforms the HTC One read "Samsung Galaxy S4 vs. HTC One: 5 Reasons to Choose the GS4." And for my unbiased opinion on the device that offers a better overall experience, check out my related blog post. The best thing about the HTC One is its look and feel. It's one of the best looking smartphones hands down. And, perhaps more importantly, it's built to last. The One also feels great in your hand, and that has a lot to do with the slight curvature of the rear panel. HTC chose to make the One's battery fixed in place, and that's not ideal, at least not for me. But one benefit of this decision was that the battery could be placed between the display and the other internal hardware components, which enabled the company to create the comfortable curve of the One's rear panel. The Galaxy S4 feels much more square and boxy in your hand than the HTC One, which isn't really a big deal. But it's still a nice touch. I also like how the front-facing speakers look on the One, and they work very well. (More on the speakers coming up.) The One's notification LED is placed beneath the speaker holes, so it's not noticeable when it's not in use - and it looks cool when the LED in the speaker hole blinks. And I like how the One doesn't have any hardware buttons on its display. The GS4 has one hardware home button. One feature that HTC really played up when marketing the One is its dual front-facing speakers with built-in amplifiers and Beats Audio tech. I suspect the HTC One/Beats partnership is mostly a marketing stunt meant to attract customers with a brand affinity for Beats products, but the front-facing speakers on the HTC One do provide better audio than the single, rear-facing speaker on the GS4. The fact that the speakers on the One face the front of the device makes it better suited for consuming media without headphones if that is something you are inclined to do. In addition, the One has two separate sets of speakers, one atop the front panel and one at its rear, so it can provide stereo sound. And the HTC One speakers sound less "tinny" to me than the GS4's speaker. The HTC One's speakers are slightly louder than the GS4, however, the difference is negligible. HTC also tells me that the One is optimized for use with Beats headphones, which implies you'll get better sound using a Beats headset than you would with headphones from another manufacturer. As I don't own any Beats products I was unable to test this claim. I prefer the display on the HTC One to the screen on Samsung's GS4, though I do wish it was slightly larger. They're both high-quality displays. However, the LCD on the One is consistently brighter, even when both screens are set to their highest brightness settings, and the GS4 display seems slightly more pixilated in some instances. Determining which phone's display is best for you is largely a matter of preference, so you should check out both the One and GS4 side by side, if you can. The HTC packs a 1080p HD, 468ppi LCD. The GS4 has a 1080p HD 441ppi Super AMOLED display. So the resolution differences aren't major; it's the display type that makes a difference here. The amount of fixed storage is notable when you consider that both the HTC and the GS4 require roughly 7GB of fixed storage for the operating system and other software components. That leaves just 9GB of built-in storage available to most GS4 users in the United States, and some data cannot be saved to memory cards, including apps - though rumors suggest Samsung has a fix in the pipeline. HTC also makes it easy to purchase unlocked versions of its One smartphone directly through its online store, which I appreciate. Samsung does not seem to sell unlocked GS4s directly, at least that I can find. I'm a bit hesitant to say that the HTC One gets better overall battery life than the GS4, because in my talk-time tests, both devices lasted for a nearly-identical period of time: Just about 14 hours on AT&T 4G, with power-saving mode enabled on both devices. The HTC One got slightly more talk time, which is notable because it has a smaller, 2300aAh battery compared to the GS4's 2600mAh power pack. That suggests that the HTC One's software could be better optimized for talk time. And my experience with the LCD display also suggests that they're easier on batteries than Super AMOLED screens. The HTC's One battery is fixed, so it cannot be swapped out with a fresh battery when it's drained, as you can with the GS4. That's not ideal for me. The HTC One also runs a different version of Android (v4.1) than the GS4 (v4.2), and that could have something to do with the difference in battery life. But overall, the HTC One seems to have better battery life than the Galaxy S4. For the reasons listed above, and many more, HTC's One is a quality smartphone that's sure to please lots of buyers. But it isn't perfect. Click on over to the companion piece to this story for five reasons why you might want to choose the Galaxy S4 instead of the One.